Llandrindod Wells01597 822600 work TownLlandrindod Wells, or 'Landod' as it is known to locals, is Wales's most central town and the administrative centre of Powys. It is one of the largest market towns in the area, holding an open-air market once a week on a Friday, and is a thriving conference and business meeting destination. The bandstand in Temple Gardens and several of the local hotels stand as testament to the identity of Llandrindod Wells as a typical Victorian Spa Town. This heritage is paid tribute to by the famous annual Victorian Festival. One week in August every year sees the town transformed into a Dickensian wonderland where penny farthings replace cars and baseball caps are swapped for bonnets. The town attractions include an 18 hole Golf Club, an international standard outdoor bowling green dating from 1912 which regularly hosts national and international events, along with a newer indoor bowling centre. There are also two museums: the Radnorshire Museum and the National Cycle Museum. The Llandrindod area also hosts the Heart of Wales Walking Festival annually and the popular Victorian week at the end of August, and the town is a regular venue for the start/finish of many annual National Car, Bike and Cycle rallies.The Royal Welsh Show, the biggest agricultural event in Europe is held in neighbouring Builth Wells. The 'healing qualities' of the local spring waters, first enjoyed by the Romans, attracted visitors to the area in large numbers during the mid 18th century. As a result, the town enjoyed an economic boom and a number of hotels were built. During the 'season' between May and mid-September, visitors to Llandrindod would take the waters at the pump rooms at the Rock Park and Pump House Hotel entertained by orchestras, and in its heyday the resort enjoyed a vast array of activities ranging from golf to horse racing. Most of the town's architecture dates from the boom periods of the Victorian and Edwardian eras when ornate hotels and shops were built, including the Metropole and the Glen Usk hotels and the Albert Hall theatre. There are also buildings in the Art Deco style including two striking former garages. The two Great World Wars of the early 20th Century saw visitors of a very different kind descending on Llandrindod, when soldiers on training courses were billeted in hotels and boarding houses, and refugees and wounded soldiers were accommodated in the town. 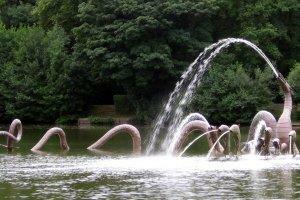 The historic Rock Park in the town and its man-made Llandrindod lake are popular places to visit. 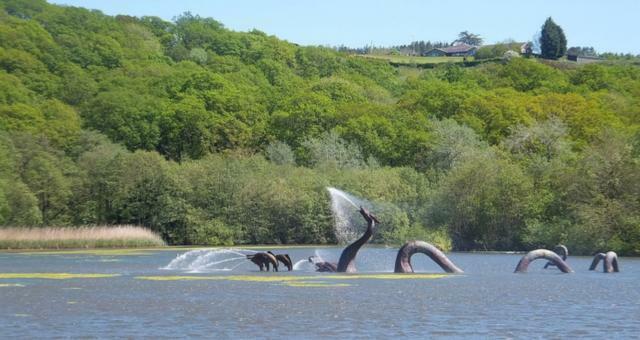 In the centre of the lake, popular for fishing and model boating, is a striking sculpture of a water serpent and leaping carp. The scales for these sculptures are made of thousands of copper plates initialed by local people and visitors during construction of the work. Abbey Cwm Hir, the resting place of Prince Llewelyn, is not far away. Llandrindod Wells, or 'Landod' as it is known to locals, is Wales's most central town and the administrative centre of Powys. It is one of the largest market towns in the area, holding an open-air market once a week on a Friday, and is a thriving conference and business meeting destination.